Owners of a subscription to The New Yorker also tend to own a sizable stack of unread New Yorkers. And what often separates the issues that get read from the ones that gather in the basket next to the coffee table is a quick glance down the contents page. There are certain marquee names. If, for example, there’s a new essay by David Sedaris, the odds of the issue making it into a gym bag rise exponentially. Louise Erdrich seems to have a similar effect. As do Calvin Trillin, Charles D’Ambrosio, and Alice Munro. Each of us has our own short list. Among readers of contemporary fiction, George Saunders is often included in such lists. He has published stories and essays in The New Yorker for more than twenty years, won a MacArthur Fellowship, appeared on Letterman, and, in the process of all this, come as close to the modern writer’s platonic ideal of a “modern writer” as one could hope. But Saunders’s recent collection, Tenth of December, shows how stories that often stand well on their own can lose their appeal when gathered together. Part of the problem involves scope—specifically, Saunders’s proclivity for focusing on his characters’ cognition. 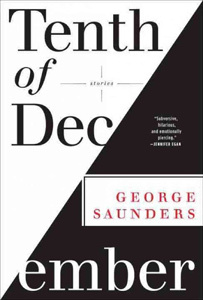 During a discussion about the story “Tenth of December” with Deborah Treisman on October 24, 2011, he stated: “Lately I find myself interested in trying to find a way of representing consciousness that’s fast and entertaining but also accurate, and accounts, somewhat, for that vast, contradictory swirl of energy we call ‘thought.’” Thus Saunders wrote each of his stories from the first-person or third-person-subjective vantage point. In addition, he utilized narrative techniques—self-interviewing with rhetorical questions, imagined dialogues—that effectively mimic a mind at work. Here, Saunders achieves the “contradictory swirl of energy” that enables Alison’s circumstances and motives to unfold in a natural and engaging way, which is why the story is so good. One could stop reading at this point and think, This guy just kills it. Which he does. Many of his stories display thrilling levels of humanity and humor— that is, when read the first time they were published, individually. But a major risk for any author—especially one whose main theme involves human consciousness—is overusing certain techniques and letting the voices of characters overlap and repeat. And among the stories in Tenth of December, repetition is abundant—stylistically, structurally, and thematically. In “Victory Lap,” Alison Pope suddenly asks herself, “Was she special? Did she consider herself special?” It’s as if she’s imagining herself being interviewed, and this setup provides Saunders the opportunity to display her youth and innocence: “Oh, gosh, she didn’t know. In the history of the world, many had been more special than her … There was so much she didn’t know … And what was a mortgage? Did it come with the house?” This stream of thought changes course only after Alison raises another question, “Who was this wan figure, visible through the living-room window, trotting up Gladsong Drive? Kyle Boot.” A simple declarative sentence would’ve sufficed in this situation, but the rhetorical question seems embedded in Saunders’s writing—so much so that it’s as if the device has become a narrative tic he cannot refrain from. Eventually, the near-constant queries throughout Tenth of December cause the characters to blur together into one unified voice: that of Saunders. When these stories appeared individually in The New Yorker, couched somewhere between a 20,000-word profile and the movie reviews, they offered a sojourn into Saunders Land, a unique landscape consisting of equal parts humor and heartbreak, and successfully highlighted the idiosyncrasies of their specific characters. But corralled and placed in a lineup, elbow to elbow, one sees that the stories are of the same height and build, that they all possess similar features. The characters’ charming quirks become merely extensions of Saunders’s narrative habits. Used again and again, the techniques seem like tricks, and then the tricks seem like cheap tricks. And then they become tedious. Perhaps a certain amount of blame can be placed on the publisher for not giving more consideration to the sum of the parts. But it would also be nice if Saunders employed a few of his own rhetorical questions: Is it time for me to retire some of these old tricks, the goofy trademark names and the hammy rhetorical questions? Is it time to maybe vary things a little? It’s time, George. George Scialabba’s What Are Intellectuals Good For? Posted in Book Reviews and tagged George Saunders, New Yorker, Short Stories. Bookmark the permalink. Trackbacks are closed, but you can post a comment.